The Ethridge, Tennessee Amish community is the largest in the South. It’s a Swartzentruber Amish settlement founded in the 1940s. Today there are about 1,500 Amish living here. Typical of Swartzentruber settlements, it is a farming community supplemented by a lot of small shops and home enterprises. Amish commerce extends off the farm with some selling products off the back of the buggy in the parking lot of a local tourist outlet. 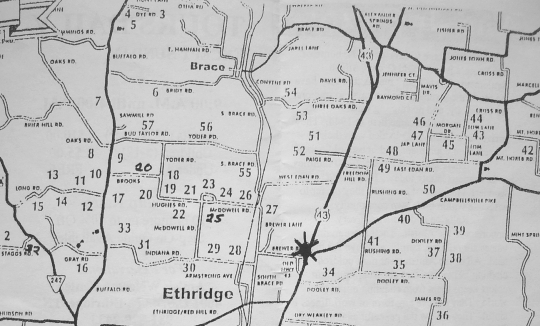 This map also gives you an idea of the layout of the Ethridge community, with about 2/3 of it west of Highway 43 and the remaining third on the east side. By the way, if you visit: be careful especially on 43, it is a fast-moving 4-lane highway but you’ll see Amish buggies traveling and crossing it as well. The Amish Welcome Center address: 4001 Hwy. 43 N., Ethridge, TN 38456, (931) 829-2433. I visited the Ethridge Amish in 2010 and wrote this piece, about mega-tourist wagons, Swartzentruber business cards, and the “Love Spell” and “Love Potion” Amish candles: The Amish of Ethridge, Tennessee. Could those possibly be birdhouses made from gourds? They look like the right shape although it’s hard to tell from the distant shot. Yes those are gourds, they are pretty common in this community. I just posted another Ethridge photo on the Facebook page w/some more in the background. It’s not a clothes line, but obviously gourds strung up to attract purple martins. I have seen this in the “Finger, Tenn.” community as well. Now is a wonderful time of year to visit the Amish in Ethridge! Strawberries are in and lots of garden veggies are getting ripe. Stop in @ the Amish Welcome Center and pick up a FREE map. The ladies in there are good with directions, too. We love going and getting all the fresh produce. This is also the community where you can take a large group horse-driven wagon tour. Another interesting tidbit that was mentioned by another poster regarding Ethridge is that this community was established, among other reasons, in protest of “bed courtship,” which is still a widespread practice among Swartzentruber Amish. On one of our first visits there, we aimed to purchase a rocking chair, but the Amish gentleman could not fit it into our car. Determined to make a sale (it was mid summer [before harvest] and things were pretty lean for the farmers), he decided to remove the rockers so the chair would fit. One rocker was stuck tight, so he hammered at it with his wrench, then part of the rocker broke off. In frustration, he exclaimed the “s” word in English. He looked as surprised as we must have. “Will you take it anyway?” he asked. We did. Can someone please give me information about Ethridge. Im confused as I read different things -some say its an Amish community others Mennonite. And now I am reading something about the area being old hippies who are just acting like Amish to selll their items. I was planning a trip there next month but now I am worried. The community depicted on the map is a Swartzentruber Amish community. They are considered the most conservative sect of all Amish. There may be some Mennonites and there may be some hippies; I can’t say that there are or are not, but don’t be worried that you’re being scammed…Hippies have never demonstrated the ability to be even remotely as productive as these people. As you drive around and meet them, the differences will become obvious. As a test, you can speak to the little ones (under age 4 or 5), and if they look like they don’t know what you’re talking about, then you’ve successfully happened upon an Amish child. Good luck! I have to say I found that very amusing Debby (no offense intended to you, just a comment on the info out there). I’d heard of the idea that actors might be hired to play the Amish but the hippie/fake-Amish scam is a new one for me. As Lattice said yes this is a Swartzentruber Amish community; not sure if there are any hippie fringe elements around the community, but if you stop by and pick up the map you should do alright if you are looking for real Amish businesses. As another poster mentioned the Amish are the most conservative. My understanding is that the Mennonite are more advanced in that they use electricity and drive vehicles. Regarding the “Hippies”, there is a community of folks in Summertown (just north of Ethridge) that are a little more “free spirited”. They are not associated with the Amish, just happen to be in the same general vicinity. Their commune is called “The Farm”. Responding to Denise about Milk or Meat. There are some who offer eggs, butter and jams. But I have never seen a farm advertise any meat or milk. You might ask around if anyone knows of anyone, just be cautious, some Amish find it offensive if you ask to purchase something they do not advertise for sale. The community you are thinking about is Lobelville, TN. They look Amish, sort of, but without the religion. The place has a high people turn over. It is more a social-political community, so people don’t get along that well. Ethridge is a Swartzentruber Amish community with no hippie elements. Hey, Debby, there is a group of “old hippies” in Summertown,TN.. Summertown and Ethridge are both in Lawrence Co. TN. You can google The Farm Summertown TN. They settled here in 1970s. Started a commune and are still here after all these years. They are not at all Amish. lol They are very nice, interesting, and very well educated folks. They have a certified nurse-midwife clinic. The midwives do house calls for the Amish. If you ever get to visit us here in Ethridge you could also visit The Farm. Our Amish folks are very old-order. No running water in the house, no electricity, no telephones, (at all), no cars, trucks, or tractors. They do not have stores, they sell everything from their homes. You will really enjoy visiting Ethridge. Like Eric says just stop by the Welcome Center and ask for a map. The Welcome Center is @ 4001 Hwy. 43N Ethridge, TN 38464. Thanks everyone for the info. We are planning on heading there sometime in june. Anything else to do in this area ? There are four Swarzentruber Amish groups. Some of us do have running water, we pump it up with a gas engine into a tank inside the barn and gravity feed it out. Also we have a/c power, we just make our own usually with diesel generators, that powers our saws and lights in the shop. About the close line. We put a large pole usually 100 foot and a pully so we can reel them out and reel them back in, all while standing on the porch. Others like myself go to another order so we can drive regular vehicles, mostly dark colored trucks. Like I say there are four Swartzentruber groups and we are still Amish. We can’t live around the old order anymore. Are you from the Ethridge area? We have Swartzentruber Amish here. Eric, I love to buy Love Spell air freshners from the Amish. Love Spell is a Victoria’s Secret brand. I giggle every time I buy it because I know they have no idea about Victoria’s secret. (I am sure they just order the oils from a catalog.) Thanks so much for the interesting disscusions. I really enjoy reading them! Have a great Memorial Day! Not necessarily so. My Amish friends love shopping at Bath and Body Works. It surprises me sometimes at how much they know about the “English” world. I really can’t remember if they were Mennonite or Amish in Madisonville,TN.I know I really enjoy them though because when I was growing up I lived in Parkersburg,WV and we would make it a weekend out of going to see them in Berlin,OH and Walnut Creek,OH,also Sugarcreek,OH.I also lived near Mount Eaton,OH and would visit the Amish there,too.I really missed it when I came back for a visit in October of last year to Massillon,OH because I couldn’t go visit them while I was in town,due to a very short vacation. Do the Amish still make Homemade Molasses or Sorghum. If they do, does anyone know when it will be available. I would love to buy some that is freshly made this fall, but I am not sure if they still make it and when they make it. I live in Alabama and I can’t find anyone here that make it. Thanks for the information. I am looking forward to visiting in the next week or two and purchasing some good homemade Molasses. Didn’t realize they also had pumpkins and gourds and peanuts, can’t wait to visit and see what else is availiable. There are quilt makers and furniture makers here in Ethridge. Some of them make chop blocks and wooden spoons, but I don’t know of any that do bowl turning. Several of them make furniture of all kinds. The map that you get from the Welcome Center shows where they are. Rhonda, if you call the Amish Welcome Center in Ethridge, TN they will mail you a free map. 931-829-2433 The Amish have their greenhouses going and have begun plowing the gardens. Can’t wait for fresh veggies! You can pick up a map he Amish Welcome Center. Also the Lawrenceburg Chamber of Commerce has good county maps. Don’t buy Amish items from the welcome center. Stop at the Amish galleries owned by David and Lori. You will see many beautifull things made by the Amish as well as local artist. Then go to the Amish Country and inquire about what you’re looking for and buy from at a lower price. Ask about canes made by David Gingerich, Baskets by Maylon Gingerich and his wife (best made baskets, I believe), Amish hats by Malinda Gingerich, Rolling pins,cutting boards andd wooden spoons by Peter Zook (beautiful),Chopping block tables by John Miller,and collapsible baskets(don’t remember their name), they are neighbors of Maylon Gingerich on Buffalo Rd.Have fun ! We are taking a trip to Pulaski in mid July and would like to visit the Amish Country near there. Does anyone know what to expect this time of year? What is the produce auction that goes on a few times a week? Does anyone know where? In mid July there will be all kinds of fresh produce. They already have tomatoes, cucumbers, squash, onions, cabbage, new potatoes, green beans, beets and zucchini. It is almost time for blueberries and raspberries. Sweet corn should be ready in another week or so. There will probably be cantaloupe by then. Plowboy Produce Auction is held every Mon., Wed., and Fri. April thru October. Their address is 469 S. Brace Rd. Ethridge, TN 38456. The sale starts at 1pm. You can buy veggies there or go directly to the Amish farms to buy them. Ethridge is about 25 miles from Pulaski. It is very interesting to go to the auction and see all the produce and the Amish farmers that grew it. Carrie, I hope you enjoy your visit with the Amish. The Amish Welcome Center has a free map of the area and the folks there can help you with directions. They are located at 4001 Hwy 43N Ethridge. I am looking for info on the woodworkers that are capable of making an oak planked tabletop. If anyone knows where these people are located, please let me know! There are several Amish shops that make tables. They all make them to order. Mr. Gingerich on S. Brace, Mr Byler on McDowell, and Mr Hosteler on Brooks Hughes Rd. are few of them. They are open everyday except Sunday. I am in search of a Amish business that sales kiln dried lumber. Can anyone point me in the right direction? Mr Neal Miller on Gray Rd sells dried lumber. Thanks Diann I will be there tomorrow. Fun meeting Amish and buying from them. I posted a couple of years ago about don’t buy from the Welcome Center. I should of said it’s more fun driving around the country roads, going up to the houses and buying direct from the Amish. The people at the Welcome Center are real nice, provide maps, horse drawn wagons tours and do have a variety of things Amish or otherwise. They also have a restaurant. 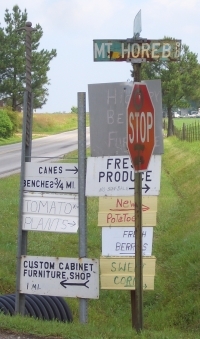 The Amish hang signs below their mailboxes and have listed as to what they have for sale. If for instance you might like a sleigh bed, they might tell you they will put you on a list and it might be a year before they might have it ready for you. This is because they don’t work exclusively just making furniture but they also farm also. It’s a lot of fun just to stop and see what they’re selling and see the furniture they make and to buy some peanut brittle and jelly. They’re really good people and the little children are adorable. Jay, it is more fun to drive around and visit with the Amish. The Amish Welcome Center tells everyone they can drive through the community. They also have the free maps to help folks figure out the roads. Right now there are pumpkins, gourds, peanuts,popcorn, and several kinds of greens and broccoli and cauliflower available. Sorghum molasses did not do well this year. An aphid got in the cane and it ruined most of it. This time of the year is a great time to visit. Some of the Amish make butter but they do not make cheese. Because they are old order they do not have refrigeration and can not be health inspected. Right now they have a lot of fresh veggies coming in. They sell everyday except Sunday. They will be open on July 4th. Looking for either a Mennonite or Amish variety shop. Mostly looking for sewing supplies. Also buy food in bulk. Ginger, the Amish here in Ethridge do not have a fabric or bulk food store. On Hwy 20 between Summertown and Hohenwald TN there are Mennonites. Yoder’s homestead market sells bulk food. There is also a fabric shop over there. 931-796-1646 is Yoder’s number. They are about 15 miles northwest of Ethridge TN. Hope this helps you. Ginger, there is a shop called Flat Rock Cheese and More, (931) 363-3603. They are located on Minor Hill Hwy (TN Hwy 11) just south of nearby Pulaski, TN, which is about 20 miles east of Ethridge. It is owned and operated by members of the local Amish-Mennonite (I think they’re Beachy) community. They have bulk foods, a deli, dry goods, and outdoor furniture and storage buildings. Great thanks! Do they take debit cards there? What about milk and meat? Do the Mennonites or the Amish offer raw milk and pastured meats (beef, pork and chicken)? Thanks! I am looking for someone that makes headboards and a long porch bench. Do you have any suggestions for someone in the community for those. There are several furniture makers in the Amish community. They custom make the bedroom furniture. Some make traditional solid wood and some are doing the primitive style that’s so popular now. You can bring a picture of what you want or they have some drawings of different styles. There are also several guys that make benches. If you stop in at the Amish Welcome Center, 3943 Hwy 43N. Ethridge, TN. they will give you a free map and directions to the wood shops. The Amish only deal in cash. They do not accept debit cards. Hope this helps. We are looking for poplar 4×4’s. Do any of the Amish have those for sale? There are several Amish sawmills in Ethridge. There is one on Dooley Rd that saws cedar and poplar. It is the second sawmill on Dooley Rd. If you need a map of the Amish area you can stop by the Original Amish Welcome Center and pick up a free map. The.folks there can also highlight the map and show you how to get there. I’m sure there is more than one that has poplar. I’m fairly new to TN (6 yrs). I’m contemplating a hobby-garage build and looking for options to build it. An architect in car club suggested I let the Amish knock it out. I’m not sure if the Amish use any modern technology for phones/internet, but looking for builder sources for my Franklin, TN domicile.